There is currently a lot of speculation about why Dale Earnhardt Jr. is not winning races, but it’s clear why he hasn’t recently been a dominant force at Talladega for the last five seasons. He’s been down on power since his glory days on the restrictor plate tracks with Dale Earnhardt Inc., which included four straight victories in Alabama starting in the fall of 2001. How can it be possible for Earnhardt Jr. to be down on power coming into this weekend’s race, considering that he drives for Hendrick Motorsports, a team that continues to be a dominant powerhouse when it comes to restrictor plate racing? It’s all relative. During those glory years, Earnhardt Jr. and teammate Michael Waltrip enjoyed a sizable horsepower advantage relative to the rest of the field. It enabled DEI’s duo to win 11 of 16 restrictor plate races at Daytona and Talladega between 2001 and 2004. This is not a knock on Earnhardt Jr. or the driving of Waltrip. It should be pointed out, however, that Waltrip’s four victories during this stretch are the only four in his 24-year Sprint Cup career, another clear indication the DEI team had an advantage, particularly at the horsepower track of Talladega. No driver likes to admit or divulge a horsepower advantage. Declaring an advantage tends to knock the other guys on one’s own team who work on the chassis, the pit crew and the aero experts, not to mention the driver. But the record speaks for itself, one that can be verfied by other details. The story actually begins at Hendrick Motorsports, in more ways than one. It was the height of the DEI era in 2004 at Talladega when the late Randy Dorton suggested I peer into an engine manifold located on a sideboard inside the Hendrick hauler. “This is what the Childress team has been doing,” said Dorton. A quick glance inside the manifold revealed a small, rectangular island on the floor of the manifold. It was designed, continued Dorton, to meet the block that NASCAR officials inserted into the manifolds. The block rule was in place for two reasons. First, the block confirmed the area under restrictor plates in the manifold was clear and second, that the floor at the bottom was flat, at least as far as NASCAR’s block test was concerned. Evidently weary of getting beat at Talladega, Dorton was revealing that the Childress team had found a gray area in the rules. He was not suggesting the idea was illegal. In fact, he was copying it, because the little raised island in the manifold helped create better airflow underneath restrictor plates to the intakes, hence better horsepower. Sadly, Dorton was in the plane crash that took his life and the lives of nine others later that fall while en route to a race at Martinsville. So I was not able to follow up on details. But eventually the pieces of the puzzle came together regarding the horsepower advantage enjoyed by DEI on the restrictor plate tracks. The second part of the story also begins at Hendrick Motorsports, where Richie Gilmore worked for eight seasons until he was hired in 1998 by Dale Earnhardt Sr. to switch to DEI. Gilmore was a carbureter specialist at Hendrick while working for Dorton, acknowledged to be one of the masters when it came to the airflow above restrictor plates. Presumably, team owner Earnhardt Sr. was privvy to the approach Childress had taken with the floor of its intake manifolds. The same year he hired Gilmore for his team, Earnhardt Sr. won his first Daytona 500 victory in a Richard Childress Racing Chevy powered by an engine with this type of manifold in it. Down the backstraight at Daytona in 1998, it is worth noting, only the Chevy of Jeff Gordon, with power from a Dorton V-8, was able to stay with the Childress entry driven by Earnhardt Sr., who was pitting earlier than others for green flag stops, another indication of more horsepower. But this time it was Gordon who was unlucky; he damaged his front air dam midway in the race and could no longer hang with Earnhardt’s No. 3 Chevy, which went on to a well-deserved victory after 19 unlucky and unsuccessful years at Daytona’s 500-miler. Once Gilmore came on board at DEI, he was able to combine the skills developed while working at Hendrick Motorsports above the restrictor plates on carburetors with the approach that had been pioneered by the Childress team on the floor of the intake manifolds. Here again, it is assumed that Earnhardt Sr. at least introduced the concept of what Childress was working on to the engine builder at his own DEI team. The passage of history makes it easier to discuss such things and it was only recently that I was able to confirm with a member of the Childress team, assistant head engine builder Danny Lawrence, that indeed Childress had discovered this gray area in the rules. “We were the first,” he confirmed. Where other teams were welding runners and so forth to the intakes around the area described by NASCAR’s block, the Childress team was carving out grooves in the floor of the manifold itself, an arduous process. Combined with the little raised island in the middle of the intake beneath the restrictor plate that remained untouched, this method provided relatively better air flow. By 2001, Gilmore’s expertise, both above and below the restrictor plate, began to pay off handsomely at DEI. The cars of winner Michael Waltrip and Dale Earnhardt Jr. were in a class by themselves at the conclusion of the Daytona 500. Due to contact entering the pits with the car of Ken Schrader, this time it was the Childress Chevy of Earnhardt Sr. that suffered a broken air dam, which forced him to fight for third on the day of his fatal last-lap accident. When Earnhardt Jr. returned to Daytona in July of that year for the first time after his father’s fatal crash, he drove the same DEI car that had been the runner-up in the February race, one that had been returned for many hours of work to the wind tunnel to perfect it. To win that night, Earnhardt Jr. drove past an under-tired Johnny Benson, who had taken two tires on his last pit stop compared to the four on the DEI Chevy. But it was obvious the No. 8 entry had more power as well as stick. On this night, Jimmy Spencer emerged from his car in the garage and suggested that Earnhardt Jr. had been given a special restrictor plate, implying superior horsepower came with as a gift from NASCAR. That charge never did match up with the circumstances behind the emergence of the DEI team. As races over the following three seasons would indicate, the cars of DEI were favorites to win on the plate tracks — especially on the high banks of Talladega, where Waltrip and Earnhardt Jr. won six of seven races. Earnhardt Jr. just missed a DEI sweep in the seven-race span because Gordon was narrowly ahead when a late-race caution fell (and led to a shower of beer cans afterward.) As it was, Earnhardt Jr. won five of seven plus one by Waltrip. Considering that the DEI team was part of a joint effort by Richard Childress, Andy Petree and Dale Earnhardt Sr. to share wind tunnel testing time for their Chevy cars through an agreement known as RAD, it wasn’t aerodynamic development alone that led to this remarkable record. It was horsepower. Inevitably, as I learned while visiting with Dorton, the secrets get out and other teams catch up. Gradually, the advantage enjoyed by DEI went away and the front-running teams got back on a more even footing. Earnhardt Jr.’s luck also went away, too, to some extent. The Talladega race won by Brian Vickers in 2006 came at the expense of Earnhardt Jr. and Jimmie Johnson after a last lap crash in Turn 3. That race was an indication that Earnhardt Jr. can certainly handle himself on even terms. But like any talented driver, give him an edge and he will beat you, say, five times out of seven. There is one interesting footnote to this story. The use of NASCAR’s block insert as a policing device during inspection came about because of an ingenious manifold used by Junior Johnson in 1994. Johnson’s now infamous and highly illegal manifold had a device that slid up under the restrictor plate during races to provide better airflow and could be lowered back down afterwards to escape detection. Johnson recorded one of his final career victories as a car owner at Talladega with this intake manifold — later confiscated by NASCAR. The driver? A guy named Spencer. who cares about earnhardt jr anymore except the media and his old mans fans , the guy has been a non factor for over 2 years , I liked his old man and what he stood for and how a 9th grade dropout could hob nob with fortune 500 execs and not take a back seat to none of them but his kid is a middle of a pack driver who showed some flash from time to time , but lets face it if he didnt have that last name and had to come up driving junk cars with bad motors he would be driving the pace car like brett bodine . It a no brainer that DEI had a horseower advantage at restrictor plate tracks. No one seemed to care even NASCAR did not care. Why ? Because prince Earnhart and son was/is the draw. When Bill Elliot was winning, NASCAR made ALL the fords raise the roof and enlarge thier spolier on their cars while chevy was able to lower theirs. 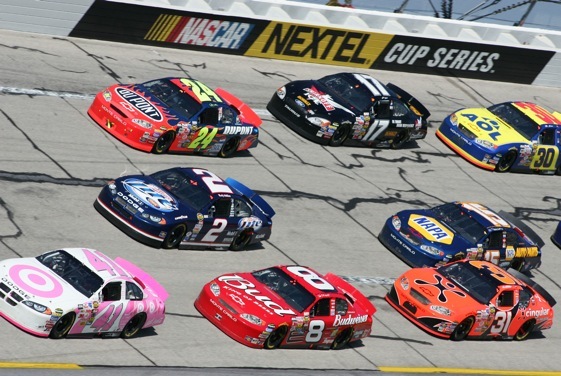 11 of 16 races come on Nascar did you have blinders on? I am loving the rating plumit.